In early slapstick films with titles such as Saucy Sue, Mary Jane’s Mishap, Jane on Strike, and The Consequences of Feminism, comediennes exhibit the tensions between joyful laughter and gendered violence. Slapstick comedy often celebrates the exaggeration of make-believe injury. Unlike male clowns, however, these comic actresses use slapstick antics as forms of feminist protest. They spontaneously combust while doing housework, disappear and reappear when sexually assaulted, or transform into men by eating magic seeds—and their absurd metamorphoses evoke the real-life predicaments of female identity in a changing modern world. 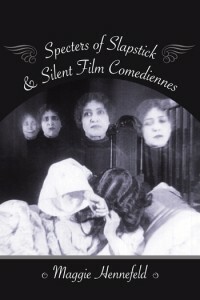 Specters of Slapstick and Silent Film Comediennes reveals the gender politics of comedy and the comedic potentials of feminism through close consideration of hundreds of silent films. As Maggie Hennefeld argues, comedienne catastrophes provide disturbing but suggestive images for comprehending gendered social upheavals in the early twentieth century. At the same time, slapstick comediennes were crucial to the emergence of film language. Women’s flexible physicality offered filmmakers blank slates for experimenting with the visual and social potentials of cinema. Specters of Slapstick and Silent Film Comediennes poses major challenges to the foundations of our ideas about slapstick comedy and film history, showing how this combustible genre blows open age-old debates about laughter, society, and gender politics.